The Thermo Scientific™ Finnpipette Stepper Pipette is a lightweight, easy-to-use repeater pipetter designed for one-handed dispensing. 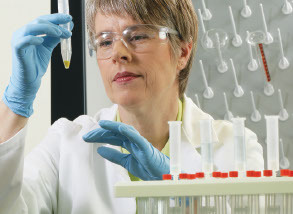 Dose liquids in required amounts from reagent bottles with the Thermo Scientifc Finnpipette Dispenser or through Graf Dispensers. Thermo Scientific™ Finnpipette Stepper Pipette is a lightweight, easy-to-use repeater pipetter designed for one-handed dispensing. Allows rapid repeat dispensing up to 45 times in succession without refilling. This lightweight, ergonomically designed pipette allows you to rapidly dispense up to 45 times in succession without refilling. Operating on the positive displacement principle, the Finnpipette Stepper is ideally suited for work with aggressive and viscous liquids. Reduce the risk of error and increase productivity in immunoassay applications. The Thermo Scientific™ Finnpipette™ Multistepper Pipette is a lightweight, easy-to-use repeater pipette that provides simultaneous dispensing in eight channels. Designed especially for work with microplates, the Finnpipette Multistepper helps speed up routine laboratory procedures. Easy to use—simply attach, fill, and prime the module, then dial the selected volume. Integrate Thermo Scientific™ Finntip™ Stepper Pipette Tips with the Thermo Scientific™ Finnpipette™ Stepper Pipetter. Choose the dispenser you require based on the solutions and the concentrations you are dosing. Graf offer five different options, Optifix Basic, Optifix Solvent, Universal Optifix HF, Optifix Safety, Optifix Safety S.